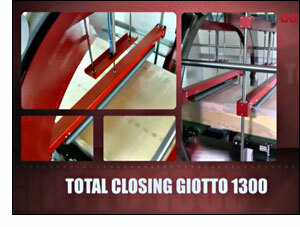 The Giotto machine is a fully automatic system for the total closure of a package without the need for a shrink tunnel. The machine incorporates spools of either Polyethylene or Bubble Wrap plus Stretch Wrap. 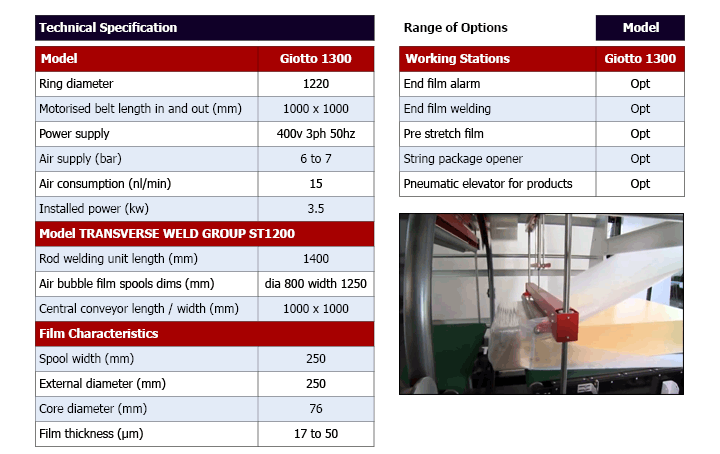 Based on the successful TC range it has been designed with an overall smaller footprint, is fully enclosed and has the ability to weld thinner film than the TC Range. Using a transverse welding group the package is sealed at the head and tail prior to being spiral wrapped. Appropriate for the packaging of bulky products with various dimensions that need a completely sealed package. This kind of packaging protects the product from all kinds of damages during the transport from the manufacturer to the end customer. The system has a control panel furnished with a touch screen directly connected to the PLC control, which enables the programming of all functions. It is possible to customise the programming. The system comes ready with an interface for the integration into an automatic production line.